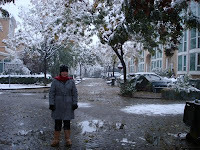 The Global Educator: It's Snowing in Beijing! For those globally who cannot see this blog post with embedded Flickr.com pics, the pics above have been uploaded directly to blogger. 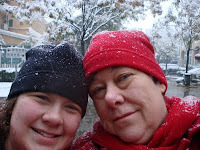 Early this morning we discovered it was snowing here in Beijing! Three hours later it is still snowing! We have been outside and done the usual snowball and snowman (sort of) fun, but now, while shoes and clothes are drying off we are watching from inside our warm house as the snow falls, the ground gets whiter and some trees lose their branches under the weight of the snow. How exciting......we have never lived in a snow city before, and after years in the Middle East and other warn countries this is a real novelty! Violet and the fire fighting equipment! 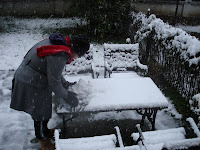 A Korean friend sent me a message and told me that it is a Korean tradition to make a wish with the first snowfall. Love the idea. This is a lot of snow for Beijing. Actually, it is the most I have ever seen at one time in five years. Beijing covered with a white blanket is a wonderful sight.